Of all the architectural advancement of the city over the past decade, the people of Da Nang are most proud of their bridges – all nine of them to date. Pre-1997 there were only two bridges on the outskirts of the city, the first built during French rule and the second the 2013-renovated Nguyen Van Troi bridge, which was originally constructed during the war by the Americans, and now serves as a foot bridge in the shape of a scallop. It has a 149-metre high observation deck in the centre made accessible by an elevator in an adjoining tower for visitors to enjoy the view. In 1997, the same year that Da Nang took its independence from Quang Nam, the iconic Han River bridge, Vietnam’s only rotating suspension bridge, was completed. If you’re up between 02:00 and 03:00, the bridge rotates 90 degrees to give access to large commercial ships passing through from the port, a very popular sight for domestic and local visitors. 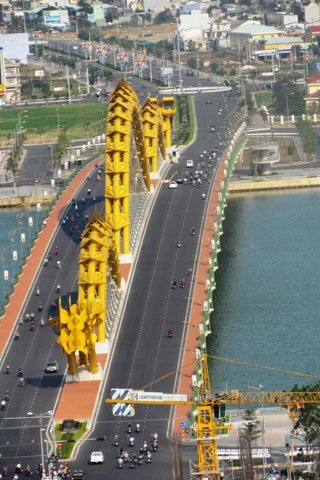 After the opening of the Han River bridge, the newly formed Da Nang government pledged that every bridge built in the city would have unique characteristics.